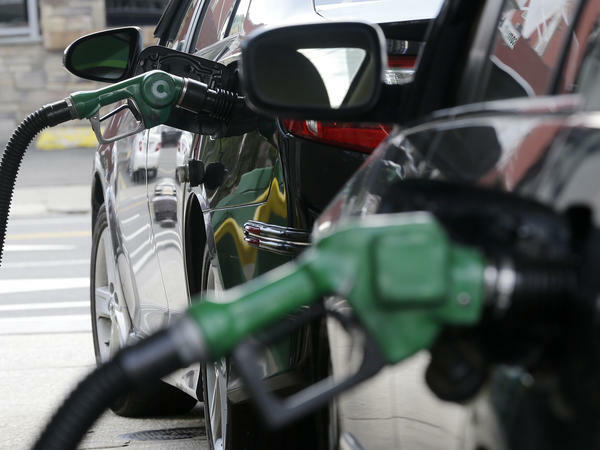 Gas is pumped into vehicles at a BP gas station in Hoboken, N.J. in 2016.The Obama administration moved to nearly double fuel-economy standards by 2025, but the EPA now is moving to weaken them. The Trump Administration today moved to weaken fuel economy standards for automobiles, saying the current ones are inappropriate and wrong. The long-anticipated move is a win for auto manufacturers, which had lobbied for lower fuel-economy standards. It's also a rejection of one of former President Barack Obama's biggest efforts to combat climate change by curbing greenhouse gas emissions. In making the announcement, Scott Pruitt, head of the Environmental Protection Agency, accused Obama of making incorrect assumptions when setting the standards, which led to them being set "too high." The Obama administration, working with California, aimed to nearly double the fleet wide average fuel economy for passenger cars and SUVs to more than 50 miles per gallon by 2025. Automobile emissions and transportation are one of the largest sources of greenhouse gas emissions in the U.S.
Pruitt's EPA is abandoning those goals and says it will work with the National Highway Traffic Safety Administration to set more appropriate standards at a later date. The move puts the Trump administration on the path toward another legal showdown with California, which has said that it will keep the stricter air standards in place. The state has a federal waiver under the Clean Air Act that allows it to set its own standards for vehicle emissions. Twelve other states follow California's lead, and together they account for a third of all car sales in the U.S.
"This is a politically motivated effort to weaken clean vehicle standards with no documentation, evidence or law to back up that decision," said Mary Nichols, chair of the California Air Resources Board, in a statement. She accused EPA of aiming to "demolish the nation's clean car program." Typically, the federal government and California work together to set shared auto emissions and fuel economy standards. Car manufacturers want uniformity nationwide, so they're not having to build different types of vehicles for consumers in different states. But the Trump administration and California are at odds on a number of issues, and it's unclear if either side would be willing to make a concession. "Cooperative federalism doesn't mean that one state can dictate standards for the rest of the country," Pruitt said in a statement. "It's in everyone's best interest to have a national standard, and we look forward to working with all states, including California, as we work to finalize that standard." The statement said California's environmental waiver "is still being reexamined by EPA." California Gov. Jerry Brown also criticized the announcement. "This cynical and meretricious abuse of power will poison our air and jeopardize the health of all Americans," he said in a statement. Any split in the nation's car market would be troublesome for auto manufacturers, which had lobbied the Trump administration to lower the standards. They argued that with low gas prices, consumers are buying more larger vehicles — SUV's and pickup trucks — making the push for fuel-efficient electric vehicles and hybrids a costly burden. Lowering the fuel economy standards, they said, would give them more flexibility to meet consumer demands. Jessica Caldwell, executive director of industry analysis at the automotive website Edmunds, said in a statement that flexibility will come with a cost. "The unfortunate reality is that this decision comes with a logistical nightmare in the short term," she said. If states divide into a patchwork of competing fuel economy standards, while a long court battle drags out, "it puts automakers in a very challenging scenario from a product development perspective."